For readers who want to design Web pages that load quickly, are easy to update, accessible to all, work on all browsers and can be quickly adapted to different media, this comprehensive guide represents the best way to go about it. By focusing on the ways the two languages - XHTML and CSS - complement each other, Web design pro Patrick Griffiths provides the fastest, most efficient way of accomplishing specific Web design tasks. With Web standards best practices at its heart, it outlines how to do things the right way from the outset, resulting in highly optimized web pages, in a quicker, easier, less painful way than users could hope for! Patrick Griffiths of London, England, has been an HTML specialist since 1999. He has worked in this specific capacity for, amongst others, Vodafone, educational establishments, and on various government projects. More recently, as a developer and instructor for his own company, Vivabit, he has given expert training to organizations such as Amnesty International, Legal and General, and London's Natural History Museum. 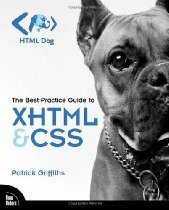 As well as writing and maintaining the HMTL Dog Web site, he has contributed to resources such as A List Apart and the CSS Zen Garden, and is an active, well-known member of the web design community.